In my summer garden. 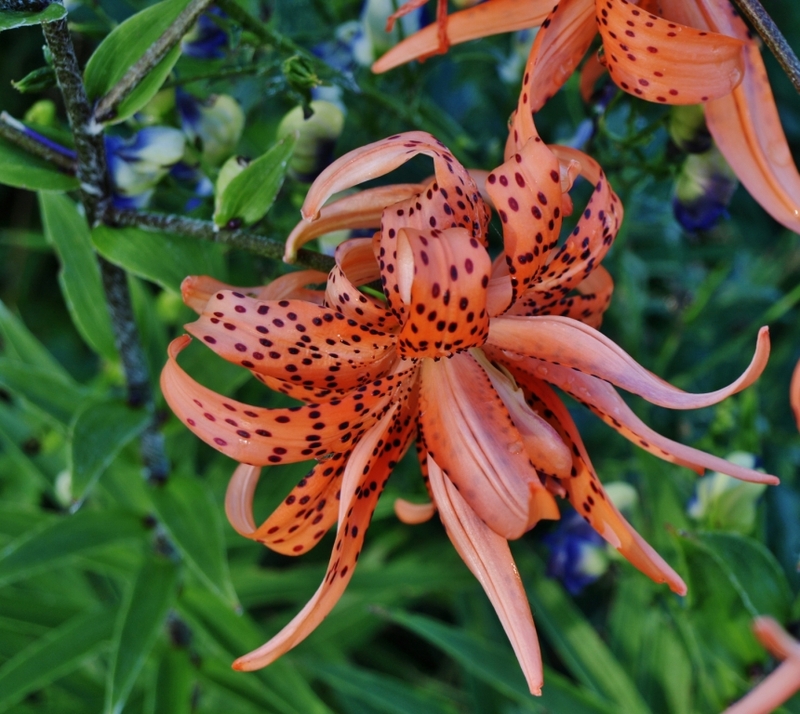 Double tiger lily, early August morning. A slightly surreal moment yesterday when a friend mentioned in passing that he had been reading the blog. He smiled as he said it and gave a nod. It sounded like he felt that was a good thing, but it took me totally by surprise and left me momentarily at a loss for an appropriate response. I murmured something about not posting much these days, he replied understandingly with a “Yes, summer…” and that’s where it ended. I have mixed feelings about knowing that people I know In Real Life are also familiar with My Online Life. 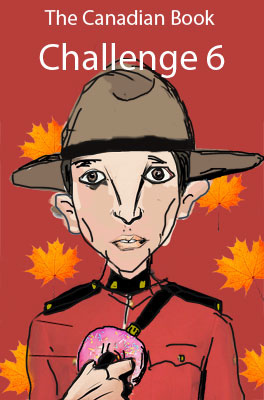 Not that I’m hiding anything, dear friends and neighbours, but knowing you are reading these posts does give me pause. I wonder why? My husband reads many of my posts, usually over my shoulder as they’re being tapped out in the early morning and during daytime tea breaks. I’ve overheard him telling people about my blogging, which I must confess makes me cringe as if this were something to be ashamed of, to be hidden. Writing about my reading gives me great pleasure, and I hope reading these posts gives something of the same degree of pleasure to all of you. It’s good to feel that one is a small cog in the vast machinery of this ongoing bookish discourse, sharing an interest with (mostly) unseen others. 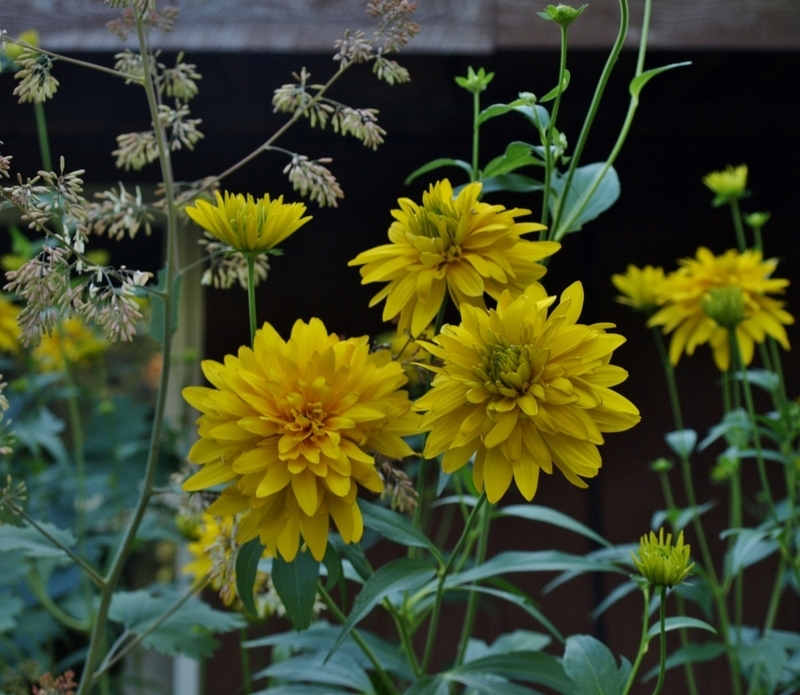 A few of the doomed rudbeckia and plume poppies in my under-the-eaves flowerbed just before the ladders moved in. Early August, 2015. Half of the roof is now off our house. Three large tarps are keeping the rain from pouring in, and of course it has been raining just enough to keep things interesting. It’s a massive job, and in our consistent tradition of never hiring anything out that we can do ourselves (and this covers all aspects of our lives except for things such as medical and dental visits, and haircuts, and removing/replacing tires from/on wheel rims, which my husband can do but absolutely hates so we patronize a tire shop for that particular job) we are plugging away all by ourselves. The two of us with the priceless help of our absolutely wonderful nineteen-year-old daughter have to date built 58 roof trusses, have removed the old roofing and rafter sheathing, porch pillars and roof and rafters, and eaves and soffit and miscellaneous other stuff (there are certainly a lot of pieces in a house, as daughter rather redundantly pointed out with frustrated passion during one of her countless trips up and down the ladder), and are now in the process of putting it all back together. And now with a quarter of the trusses up in place, we can at last truly visualize the finished project. It will, when done, be wonderful. No more scary sessions shovelling snow off the darned thing, no more leaks. I should really be documenting this project in photos, but I haven’t yet taken a single one. I should remedy that, because once this is over it will all be a blur, as we move inexorably on to the next thing on the project list. 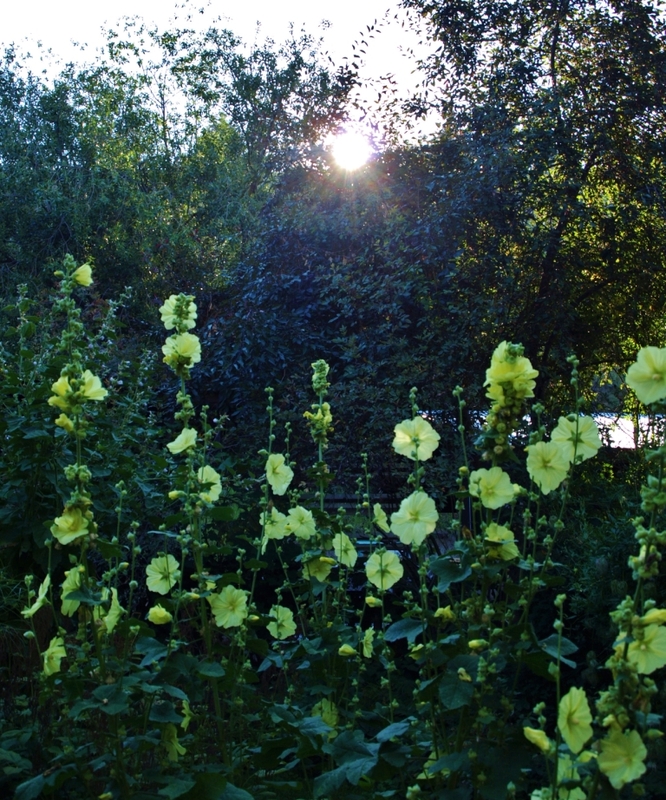 Russian yellow hollyhocks, rising sun. Early August 2015. My 1976 Pan edition sports this gruesome cover illustration, chock full of spoilerish clues. 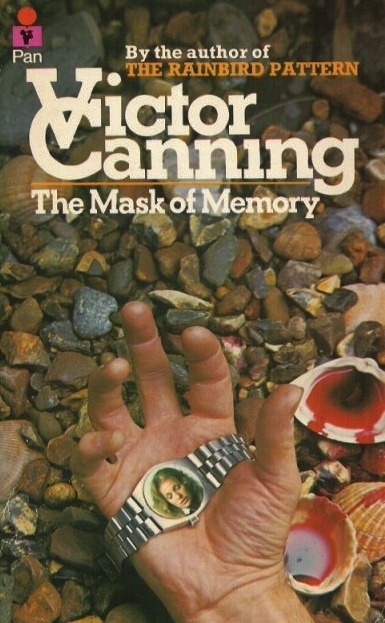 The Mask of Memory by Victor Canning ~ 1974. This edition: Pan, 1976. Paperback. ISBN: 0-330-246941. 237 pages. Well, this was a welcome surprise. 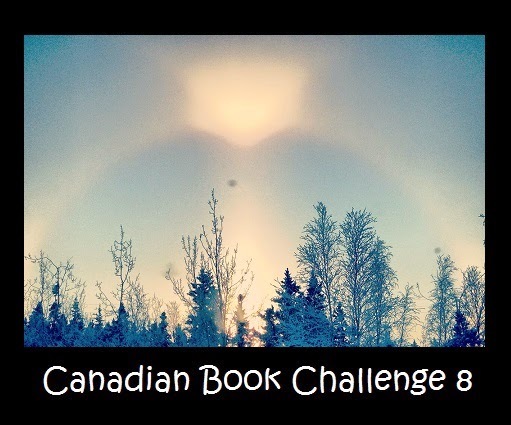 A random find among the tumble of abused books at the Williams Lake Share Shed – located just before the community refuse dump, where one may drop off unwanted items with some life left in them. It’s seldom on my book search route as it’s a bit out of the way for me, but I certainly scored this time round. Besides the Canning book, I snagged a hardcover copy of Agnes Newton Keith’s Land Below the Wind, five immaculate hardcover copies of Richmal Compton’s William books, a Laurie Colwin, an Ernest K. Gann, Terry Fallis’ latest comic effort, and, most unexpected, an intriguing, chatty, and (at cursory browse-through) chockfull of good-sounding recipes, 1966 cookbook called Cooking with Love and Paprika, ostensibly by notable Hollywood director-producer Joseph Pasternak. Yum! – to all of these. 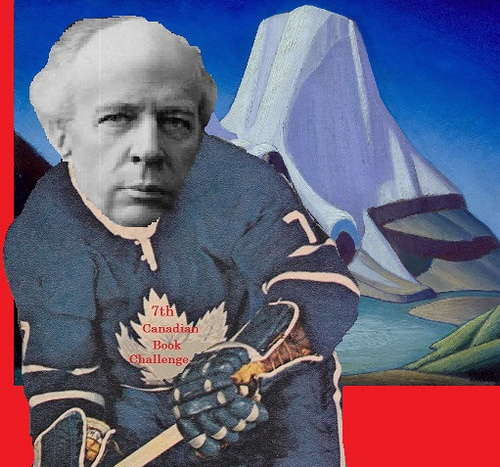 But back to the Victor Canning. I already hold this writer’s most famous juvenile – The Runaways, 1971 – in nostalgically good regard, and I did know that he was also the author of a substantial number of detective/spy thrillers, but until now I had not actually read one of these. If The Mask of Memory is anything to go by, a promising shelf’s worth of future light reading has just materialized. In a small seaside town in Devon, middle-aged Mrs Margaret Tucker wanders through the local department store, filling her pockets with packets of shoplifted sweets. She walks serenely out the door, her petty larceny unnoticed by the store clerks, and gets into her car, where she finds herself inexplicably crying. Pulling herself together, she drives through the town and out to the dune-edged estuary, where she walks across the sand to meet a group of children from the local orphanage, in charge of a nun. Giving the sweets to the Sister with a murmured “For the children”, Margaret then steps back and watches the straggling group proceed down the beach, and her tears return. For Margaret is being shadowed, and not as one would expect by the department store’s detective – if they indeed have such a person on staff, which seems doubtful, for Margaret has been carrying on with her petty pilfering undetected for months now. No, she is being followed by a private inquiry agent employed by her mostly-absentee husband to record her movements, and, as well, Margaret’s sand dune walks are under close scrutiny by an oddly reclusive birdwatcher/amateur artist/casual laborer who lives in a secluded cottage nearby. Both secret watchers are out for what they can get, and in well-bred, desperately lonely, until-now-faithful, conveniently-independently-wealthy Margaret Tucker they have found something of a golden jackpot. For her husband Bernard seems content to keep paying the private detective for his weekly reports – a nice little income stream, not likely to diminish anytime soon – while the dune watcher is after something a little more intimate, and ultimately more financially rewarding. Margaret’s husband leads a dually secret life as a senior member of an unnamed British government internal espionage department. His wife of many years thinks he is involved in industrial chemical sales; his superiors and co-workers have no idea he is even married. But his two secret lives are about to be exposed, in a building cloud of tense drama. Two plot lines drive the story. Margaret’s emotional and mental trauma lead to her first ever extra-marital love affair, and her seeking of a divorce from the all-unaware Bernard, who himself has been secretly yearning to be freed from a marriage gone still and cold. Meanwhile, back at the office as it were (or The Department as it is referred to throughout), Bernard is deeply involved in the upcoming revelation of a critical political exposé, and has just come home with a folder of highly sensitive documents as well as a secret recording device potentially throbbing with delicate secrets. The suspense builds, partial revelations are made on all sides, someone dies, and the politically toxic papers and James Bond-worthy recording-device-wristwatch turn up missing. Is the death an accident, or murder? What does the private detective really know? Is Margaret’s lover deep down true? Is Bernard a traitor to his nation? A snarl of lies, deception, ethical qualms, love and lust (of every type) must be sorted through before the surprisingly hopeful ending. While this is not a top rank sort of thriller – just a few too many over-simplifications, logic gaps and blurred-over bits for absolute suspension of disbelief on the part of the reader – it’s a very easy read. Victor Canning spins a nicely complex web, and the strengths of his writing style outweigh the logic deficits of the plot. A very decent example of 1970s-era espionage/thriller fiction, with a well done domestic drama going on concurrently with the spy stuff. I will be shelving this one between Mary Stewart and Helen MacInnes, one shelf down from John le Carré and Eric Ambler. Victor Canning. Making note of that name and adding to the look-for list for my next foray into the big city used book stores on upcoming fall road trips. Another The Mask of Memory review here, from Nick Jones at Existential Ennui. The Healing Woods by Martha Reben ~ 1952. This edition: Thomas Y. Crowell, 1952. Decorations by Fred Collins. Hardcover. 250 pages. From my late mother’s bookshelf, a likeable, low-key memoir. Now shelved with Betty MacDonald and Rachel Peden, as it is of similar vintage and appeal, though more sober in tone than MacDonald’s humorous narratives, and more limited in scope than Peden’s musings on mankind and nature. Martha Reben’s mother had died of TB when her daughter was six years old, and some years later Martha was diagnosed with the dread disease herself. The prognosis wasn’t good. After three years of bed rest and a number of unsuccessful operations, Martha in a last-hope move decided to try something a bit different in order to save her own life. Fred was shocked when M. Rebenstisch (her publisher later shortened her surname to Reben) turned out to be a young lady, and at first refused to take her on, but she eventually talked him round. 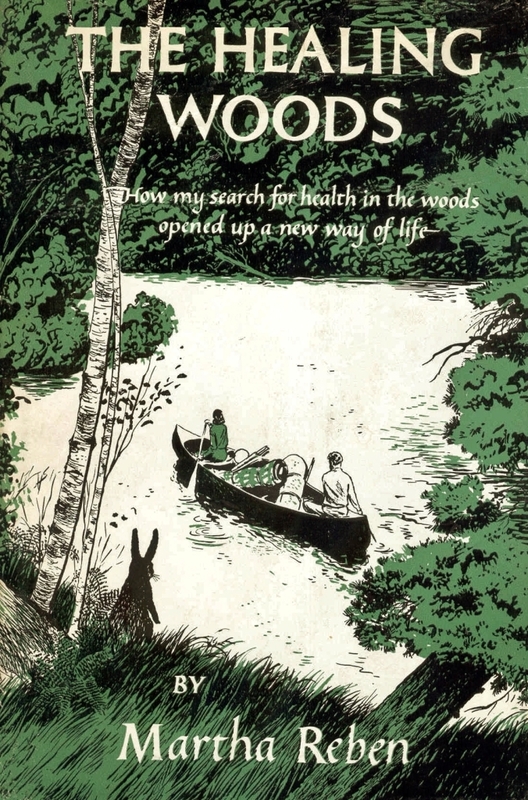 Against all doctors’ advice, and with his wife’s permission and her father’s reluctant blessing, Fred Rice loaded frail Martha into his canoe, propping her up with pillows and enveloping her in blankets, and the two set off for a campsite eleven miles away. Here Martha was established in a tent as her good-natured caretaker went about his daily chores. Soon Martha was venturing a little farther into the woods on each of her gentle walks. She started to sit up in the canoe for short excursions, and then to wield a paddle. Tired of Fred’s uninspired cooking, Martha began to take on kitchen duties. The combination of fresh air day and night, abundant rest interspersed with enough chores to keep things from getting dull, and the companionship of cheerful Fred and a multitude of woodland creatures worked its magic. By snowfall that year, when the lake was icing over and it was time to break camp, Martha was well on her way to being cured of her TB, though she was still unable to partake in more strenuous activities. With modest financial help from her family and the occasional assistance of the Saranac Lake villagers with such jobs as firewood chopping, Martha moved into a small cabin for the winter. When spring came, she and Fred again headed out to their camp, where this time round Martha was able to manage for herself much of the time while Fred went off on guiding jobs. The pattern of three seasons sharing a home base camp and winter in town was to continue for many years. The platonic relationship between Fred and Martha was to last until the end of their lives. The two enjoyed their mutually beneficial coexistence out in the woods, sharing a deep love of the nature and of “bushcraft”, and of reading and spirited conversation. Fred’s wife Kate also became firm friends with Martha, helping her with winter household chores and cooking for her on Martha’s bad days. Searching for a way of generating some income while still living in the country – a return to bustling New York City holding no appeal – Martha decided to more seriously pursue the craft of writing. 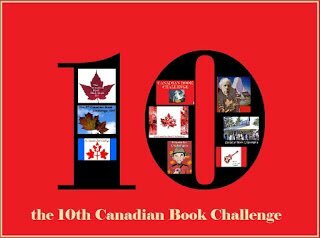 She wrote newspaper articles and re-worked her journals from those first years in the bush with Fred into her first memoir, The Healing Woods. It was received by the public with warmth and became a modest bestseller, an unusual “ends well” story which was inspiring and positive. Though Martha eventually was officially “healed” of her TB, her constitution was always fragile. She died at the age of 58 in 1964, and Fred at the age of 90 in 1966. I quite like this book, though I can’t in all honesty call it a true “hidden gem” – it’s a minor sort of work, though very good for what it is. Its author writes with evident appreciation about her life in the woods, and with acerbic affection about her human companion. The Healing Woods is the slightest bit uneven in the early chapters, but the writer soon settles into her stride. The resulting memoir is a no-nonsense, no-self-pity evocation of one woman’s healing journey, soon expanded to become an eloquently realistic ode to the natural world. I wonder what Martha Reben’s life was like after that turning-point season in the woods? 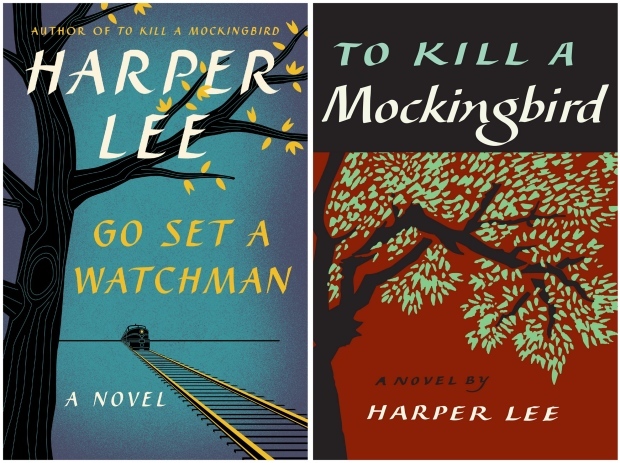 Two subsequent memoirs are now on my watch-for list, The Way of the Wilderness, and A Sharing of Joy.